Basemap > Blogs > PTAL – why is London obsessed with them? Should we add ITN and Urban Path data to the DataCutter? Having spent the last 8 years looking at transport travel time (accessibility) solutions I am still amazed at how much coverage PTALS are given in central London. Having just read the latest issue of Local Transport Today (LTT) there are three articles which have lovely PTAL maps showing areas in London and their respective PTAL ratings. On the latest front cover of LTT is an article which covers TFL’s new WebCat tool, which is a great interactive tool showing areas within London and their PTAL scores. PTAL generally looks at public transport accessibility by taking into account walk time to stop, number of services available and the frequency of services at that stop. The one important thing I feel that’s missing from PTAL is where that services goes and what the travel time is/how far can you get. I have decided to take an area with the lowest PTAL score possible on Chertsey Road in Twickenham, right near the stadium, this is given a score of 0. I chose this area as I know it fairly well; also it shows how a PTAL score can vary massively within 100m in an urban area where in this example it has shot from 2/3 which is an ok score to 0. I have therefore decided to look at this in detail using TRACC and the methodology used outside of London. I am going to break this down into 3 different calculations/maps. 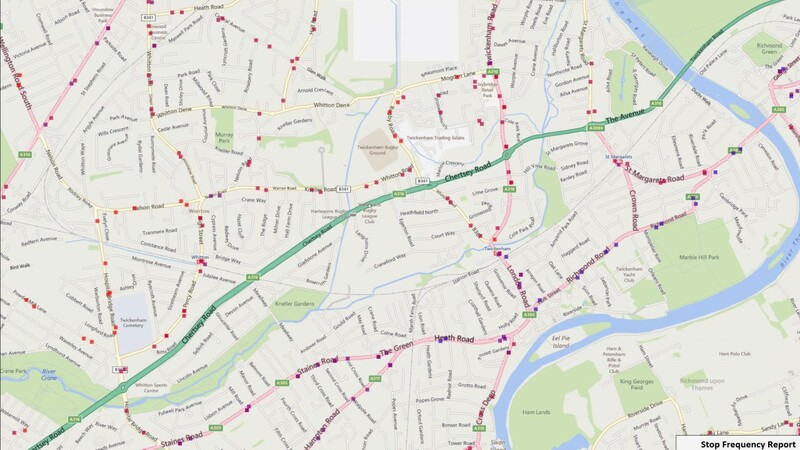 First off I’m going to look at access to the current public transport network; I have used the local accessibility algorithm in TRACC to undertake this run, as you can see in Image1 the site is situated almost 400m away using the road network from a stop with at least 1 bus per hour calling at it. You could use a crow fly’s score of 200m if you wanted a less accurate view. Either or, both are within the planning frameworks advisory 400m catchment. First off I’m going to look at access to the current public transport network; I have used the local accessibility algorithm in TRACC to undertake this run, as you can see the site is situated almost 400m away using the road network from a stop with at least 1 bus per hour calling at it. You could use a crow fly’s score of 200m if you wanted a less accurate view. Either or, both are within the planning frameworks advisory 400m catchment. The next stage is to have a look at the frequency of service. Using TRACC’s stop frequency calculator (IMG2) we can tell the frequency is between 4-12 buses an hour calling at the two closest stops on a Monday 7-9am. When this is broken down in more detail you can find out the stops are Tayben Avenue Stop B which has 9 per hour, and Tayben Avenue Stop P has 6 an hour, served by bus services 481, 281 and 681. 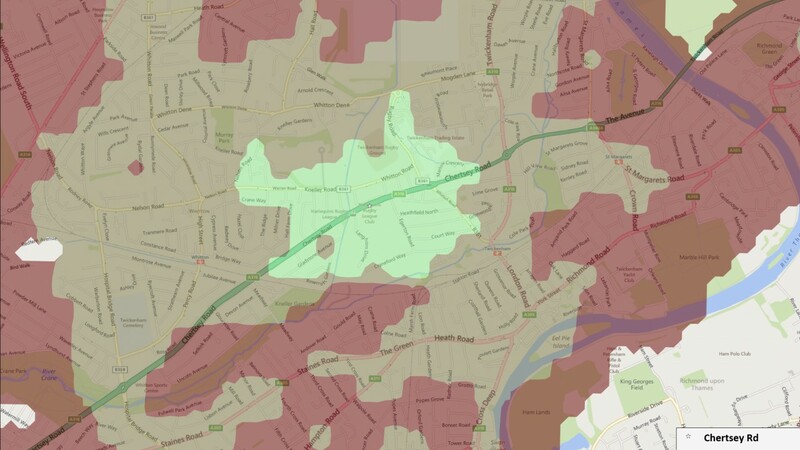 This therefore shows the site has good access to the local network within 400metres with a minimum stop frequency of 6. The final thing I wanted to look at was travel time away from the site using public transport and walking, so far we have looked at travel only to local stops, no idea has been given around travel time to schools, hospitals GP’s etc, the key destinations required when new homes are built. 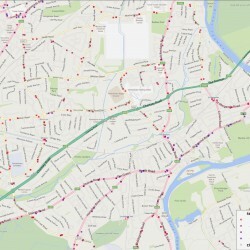 Two maps have been produced, the first (IMG3) showing a local view of 10, 20 and 30 minute access by all modes of transport, this covers much of the urban spread of Twickenham which means that many shops, schools and GP surgeries are within the 20 minute catchment area offering great accessibility. The second map (IMG4) is showing an extended view – showing within 30 minutes you can get to Staines-upon-Thames, Kingston-upon Thames, Brentford and many places before the 30 minute cut off – this shows there are great links to other urban areas from this site. 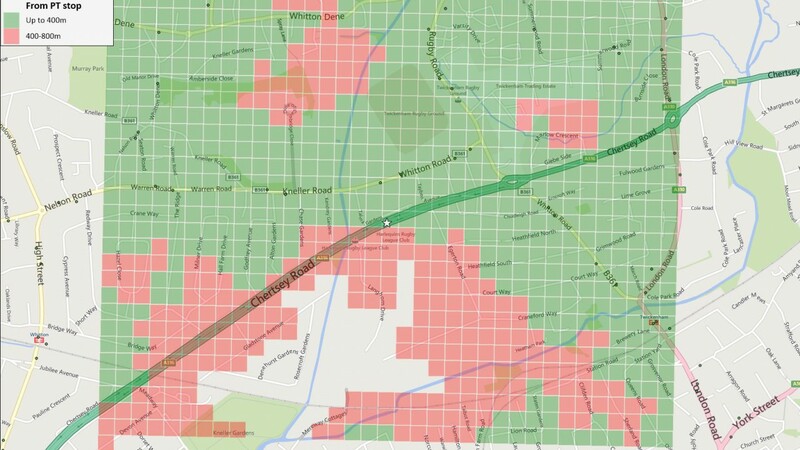 If we had decided to link in demographic information to the results, I am sure we would find that a lot of population could get to/from Chertsey Rd. So to conclude, why has this been so badly reported by TfL and PTALS? It could be because the main road – Chertsey Road is a dual carriageway with nowhere able to cross, though when you look on Streetview you can see scatted crossings on the road, with other “manmade” crossings elsewhere – like the following example. So don’t judge a PTAL by its score, as shown on an old case study of ours which overturned a planning decision.